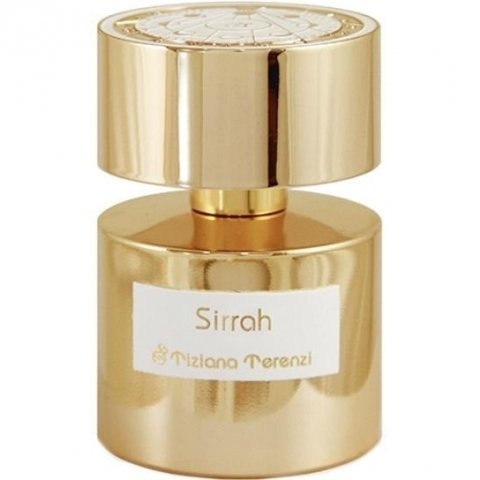 Sirrah is a new perfume by Tiziana Terenzi for women and men and was released in 2018. The scent is fruity-spicy. Projection and longevity are above-average. It is being marketed by Cereria Terenzi Evelino. I like scents from Tiziana Terenzi. They are usually very high quality, intense, have a character and a great performance. At first I thought, "Wow, what a great fragrance! "I must have one." He got off to a very nice start: fine green. If these are fruits, then they are not ripe and juicy, but still green-fresh. Over time, very fine leather echoes join in, making the fragrance incredibly attractive. A beautiful mochus (very much of it) is added and makes the whole thing a very fine, green-milky, noble skin scent. I say skin scent because the scent does not project properly in this phase (1st hour) yet. In the 2nd hour a clear birch tar note is added (at least that's how I perceive it). It makes the fragrance much more masculine, but also more interesting. (I don't notice any flowers, by the way). I still don't know exactly what it is that smells so much like chlorine to me. But this note or chord projects quite strongly, it's very hard to wash away and it's annoying!!!! But so chlorine-rich now the fragrance remains throughout the long day. Definitely a big flop for me. No, it's certainly not because the scents are badly made. On the contrary, I always find them to be of very high quality and in some respects unique. They all stick very long and are usually equipped with a clear projection. Actually, all characteristics I like to jump at. I experienced them only very often as self-willed dominant and sometimes scratchy, so that rather rarely the desire arose to have a TT-fragrance in my collection. Immediately after spraying on, I have the impression of standing ankle-deep in sourish-harsh fruits (quince / passion fruit). Actually, I'm not a big fruit scent fan, especially not when they seem sticky-sweet. But I appreciate the sour fruits, because they seem particularly vital and alive to me and therefore often provide a pleasant freshness kick. Already at this time I am impressed by what Paolo and Tiziana Terenzi have created here. The predicate "the two can be fruit" is safe from my point of view. Very gradually and slowly the fruits "ripen", gaining fruitiness and restrained sweetness. Very fine saffron threads and tingling pepper penetrate the fruit and create a very special twist. In general, all fragrance components seem to be very agile, tumble wildly and do not adhere to any order. But that's exactly what makes this fragrance so alive. Rose and amber throw their virtues into the ring and provide a fine-flowered ambry climate. Not too much and not too little, but balanced to the point. You have to be able to do that and the Terenzis seem to be able to do it. Aromas of light woods and fluffy soft musk underline the lively hustle and bustle. There is still no real order in sight, all participants are dancing together and still manage to create a uniformity and synchronicity that is extremely good for the fragrance. And then there is a special note that is present throughout the entire (very long) scent. First of all, I was guessing light oud. During my research however I found out, it must be that special oxygen-molecule, which is responsible for that especially light and light cutting scent impression. How's that work? I don't know, I don't know. But it's also one, because it does a pretty good job. "Sirrah" to me is far from a classic fruit scent. For a long time I find it rather bitter-freshly acidic. This changes in the course of the fragrance when the other fragrance protagonists join in and provide for restrained sweetness, floridity and spiciness. Sirrah" isn't really sweet for me, but it is milder, finer and equipped with a feel-good base. Personally, I like "Sirrah" best when it is a little warmer and the fragrance can play its refreshing side to the full. This is also supported by the Sillage, which is clearly perceptible, but not exaggerated. Based on my personal test experiences, I would classify it as unisex, because the sour-fruity is in the foreground. But of course this can be different for everyone. As usual with the Terenzis, "Sirrah" is also an Extrait de Parfum, which has an ambitious price with 365€ for 100ml. Whether the really high-quality ingredients and the pretty bottle are worth it, must be decided each for himself. "Tiziana Terenzi's project deals with the "future of memories." Legend has it that matters of the heart, everything incomplete and lonely, end up on the moon. Thoughts, feelings, dreams and tears, elapsed opportunities and unfinished deeds are stored here in precious glass ampoules. Tiziana Terenzi was inspired by these images for her collection of exquisite Extraits de Parfum. By perceiving them through our sense of smell, we regain possession of what we believe to be lost. By wearing them on our skin, we experience a new feeling of happiness and wonderful amazement. This collection is dedicated to "rediscovering" what we seem to have forgotten and what we could not forget. Tiziana Terenzi goes back to the places with their warm summer nights under a shining moon and glittering stars. Seen through the eyes of a child, they appear full of magic and wonder. The memory itself makes her even more enchanting." Write the first Review for Sirrah!